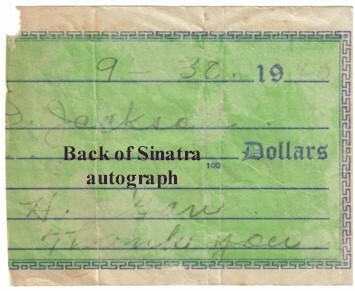 Original Vintage Autographs by Frank Sinatra EARLY in his career in 1940. Also, several others including Chico Marx and the Ink Spots Provenance follows. This is for a collection of autographs displayed in a frame from an estate. The sellers loved to collect autographs, but never seemed to have a slip of paper with them, so whatever was available was signed. As a result, the signatures have good provenance. One is on the back of 1942 driver's license and other is on an old post card. This couple went to California and Las Vegas frequently in the 1940's and 1950's and this is when this set of autographs were collected. The autographs were in a frame and hung in a prominent place in the home for all to admire. I decided that instead of selling individually that I would keep the collection in tact and sell together as original put together over several years by the original owners. .
Frank Sinatra, early autograph. This is on the back of a receipt that is dated September 30, 1940. It is in pencil and the paper has yellowed. Solid consistency with Sinatra signature study for 1940 period style signature. Chico Marx autograph on the back of a 1942 Missouri license. Frankie Laine signature on a vintage post card for Eddie's Oasis in Los Angles. Bill Kenny, leader of the 4 Inkspots. "Into each life some rain must fall-". On an advertisement flyer. 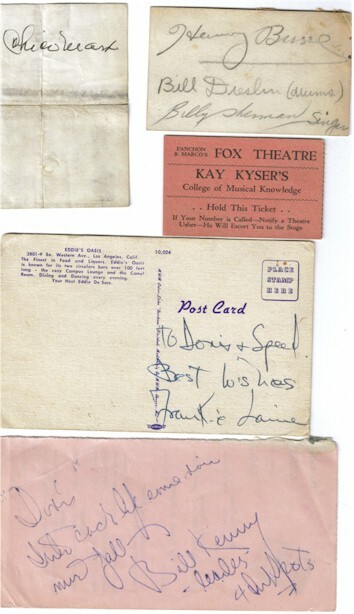 Members of the Kay Kyser College of Musical Knowledge band and the ticket from a performance at the magnificent Fox Theatre in St Louis. The signatures are on the back of a business card. 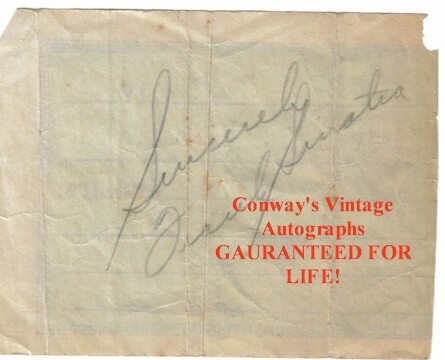 THIS IS A FABULOUS COLLECTION OF AUTHENTIC AUTOGRAPHS FOR THE SAVVY COLLECTOR. DON'T LET THIS GET AWAY! !